WhatsApp video calling features has been rumoured since last year with lot of leaked images from a German website showing video call feature on WhatsApp for android. 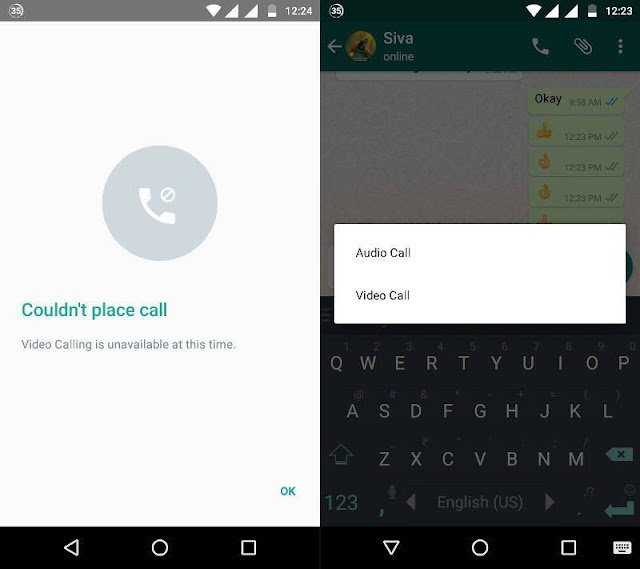 According to FoneArena, whatsApp has started rolling out a latest beta (v2.16.80) version that support whatsapp video call, in these version two option pop out one with voice call and the other with video call shown in the image below. Though this feature is not active yet but some user in some countries were able to use the whatsapp video call. In every rumour there is an atom of truth in it, don't you agree? Despite the fact that it has been rumoured last year yet not available but with this, i think WhatsApp video call is rolling out to all whatsapp users sooner than we expected.